Enjoy the buzz of the event village with this unique race. Great for PB setters, this course is predominantly flat with a fast finish along the racecourse. Come along for some awesome goodies and an opportunity to smash your PB. 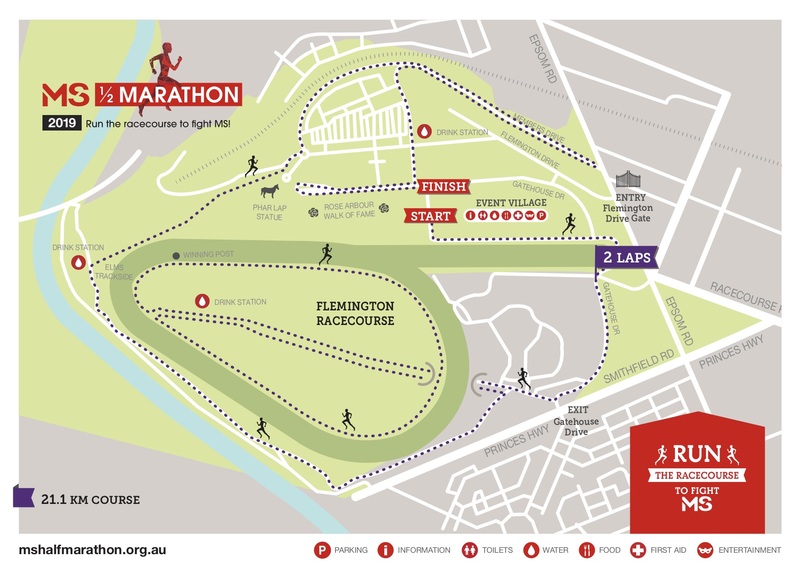 A stone throw from the CBD, the Flemington Racecourse offers the perfect venue for a half marathon. With the choice of a 5K or 10K course youll be certain to keep yourself on your toes. All topped off with the infamous Flemmington rose gardens this will be unlike anywhere youve run before - and all for a good cause. 3 x MS Melbourn rest sites with water, toilets, bike mechanics and first aid. 5 x MS Half Marathon water stations. 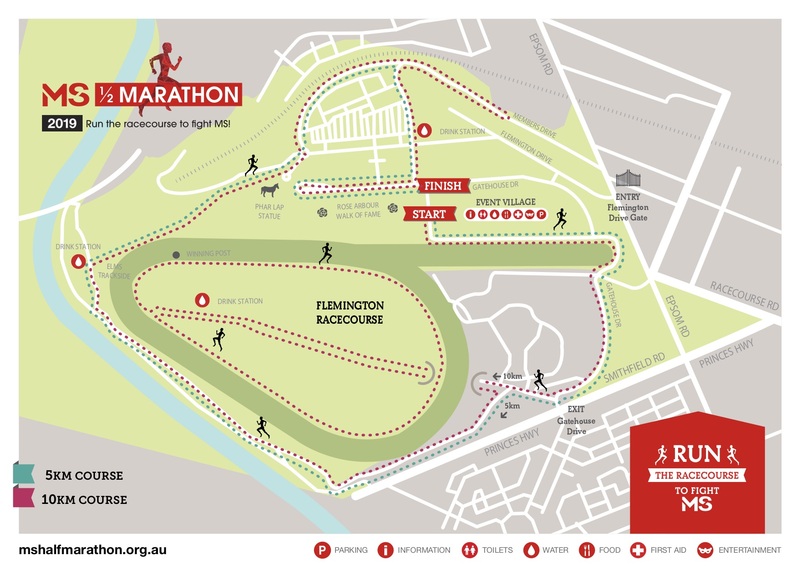 Keeping within Flemington Racecourse throughout, the half marathon route offers a course along racecourse roads. Shorter circuits still within the racecourse you'll never be too far from the best of the atmosphere. All routes will be sure to transport you into the countryside as there are no cars to dodge and some stunning gardens to take in! Be sure to check the weather and prepare accordingly! There is parking available for $20. Disabled parking free. The usual thing's you'd wear while running and don't forget to also check the weather. Spectators are welcome and there will be lots of entertainment at the event village. So come along to support this fantastic cause. Volunteers are an essential part of our fundraising events. Every year our volunteer team contribute time, effort and passion to ensure the ongoing support of those living with MS. We love to see old faces and new and we would love you to join us at the MS Melbourne Cycle + Half Marathon on Sunday 31st March 2019. Volunteering is a great way to learn new skills, meet new people and give back to the community. Check out the available volunteer positions on the organiser's website, there’s a role to suit everyone! For the Half Marathon you must be 16 on the day of the race, while runners of any age can compete in the 5K and 10K. All children under the age of 13 years must be accompanied by an adult. Is the run wheelchair and stroller friendly? All runs are wheelchair friendly. Walkers, pushed wheelchairs and strollers are only permitted in the 5km and 10km run. Half Marathon's can take anywhere from just over an hour (if you're a speed demon) to just under 3 (for those who prefer to stop along the way). An average target for first timers is under 2 hours - but it really depends on how quickly you run! Can I participate in the ride and the run? It's not recommended as both events could overlap however, if you're really keen it is possible. Bare in mind however, that you'll have to register for both and have two fundraising pages. How was MS Half Marathon?